We woke up feeling slightly better again, and made it to breakfast. 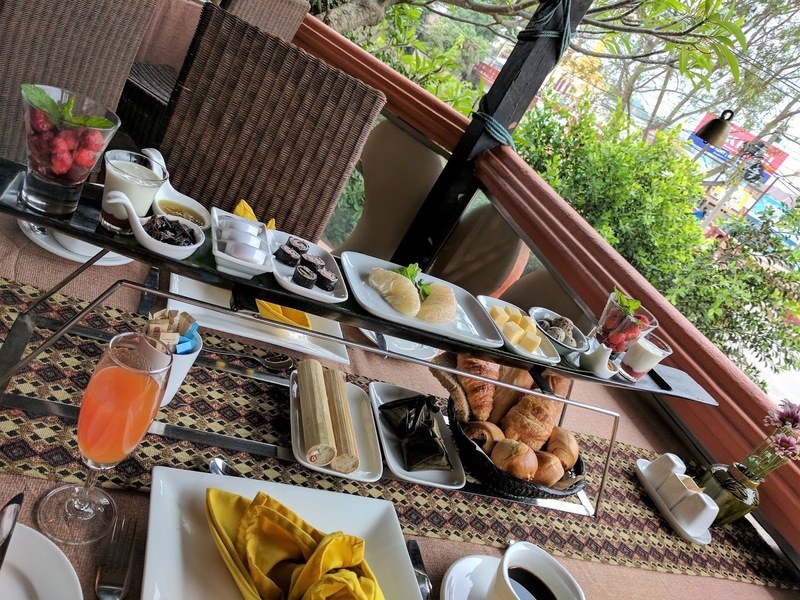 A beautiful breakfast display was delivered to our table shortly after we sat down. They brought out a tray shaped like one of the local, flat, Inle fishing boats, topped with a variety of recognizable and “new to us” foods. Additionally, we got a lovely basket of clearly locally-baked breads, including delicious croissants. I’m pretty sure this is a Swiss-owned property, so of course they have tasty croissants. 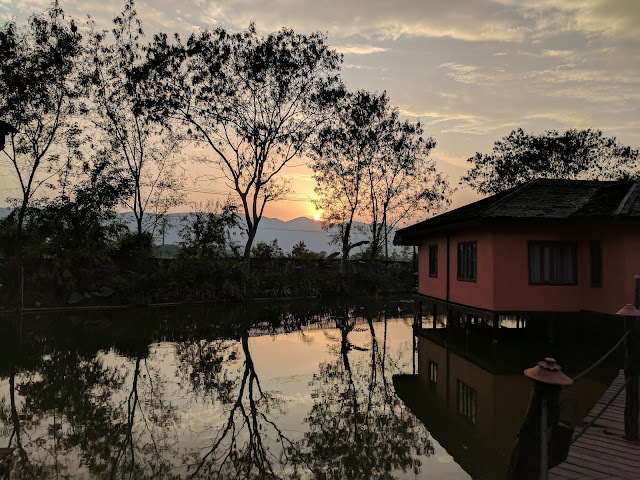 And the coffee – a super bold Arabica grown in the nearby mountains – the best I’ve had in Asia so far. If I was feeling 100%, I would have had more than the two cups that I drank. One of the hotel employees, seemingly a manager of some kind, named Kyi (pronounced Chee), struck up a conversation with me while I was having some coffee, before Caroline was ready to join me for breakfast. His English was pretty good, after being in the hotel business for 25 years. Kyi comes from the village of Inthein, at the south end of Inle Lake. I was wearing my dark orange Shan-style shirt, which he came over to compliment. He assumed I must have bought it at one of the villages out on the lake. 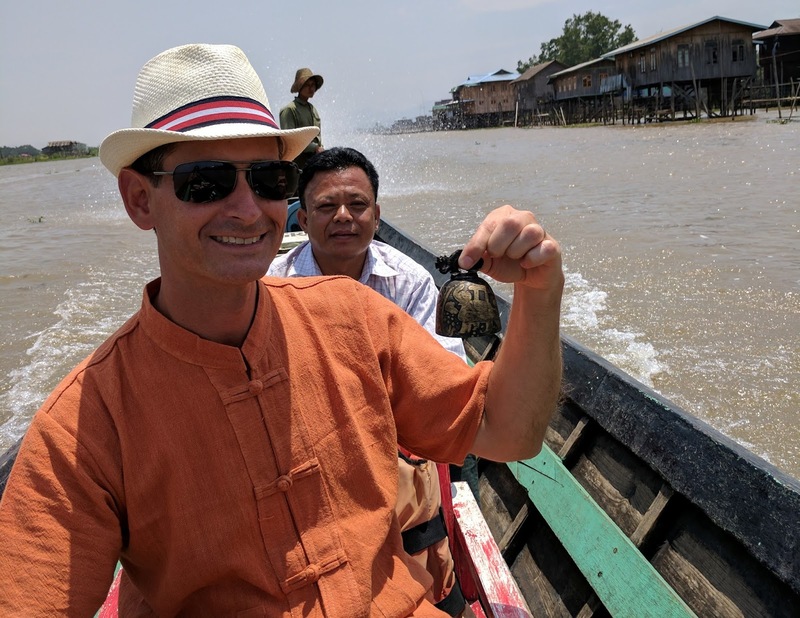 When I told him it was from Kalaw and we hadn’t yet been out on the lake, he offered to have his son, a freshly-minted graduate from ‘guide-school’ in Kalaw, tour us around the lake. Apparently, his son is learning English, and would know much more than the local boatmen. 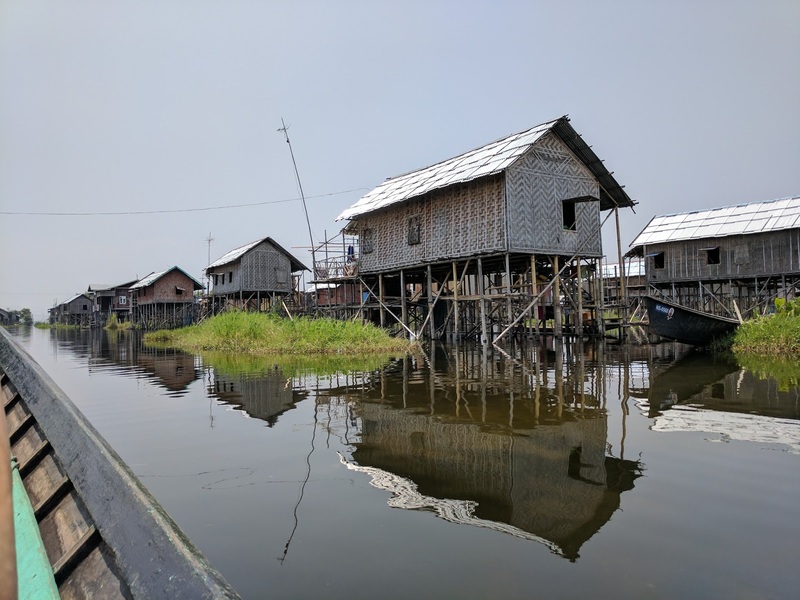 The guide does not drive the boat; he rides along taking you to locations of interest, gives a bit of information, and acts as translator with the boatman. 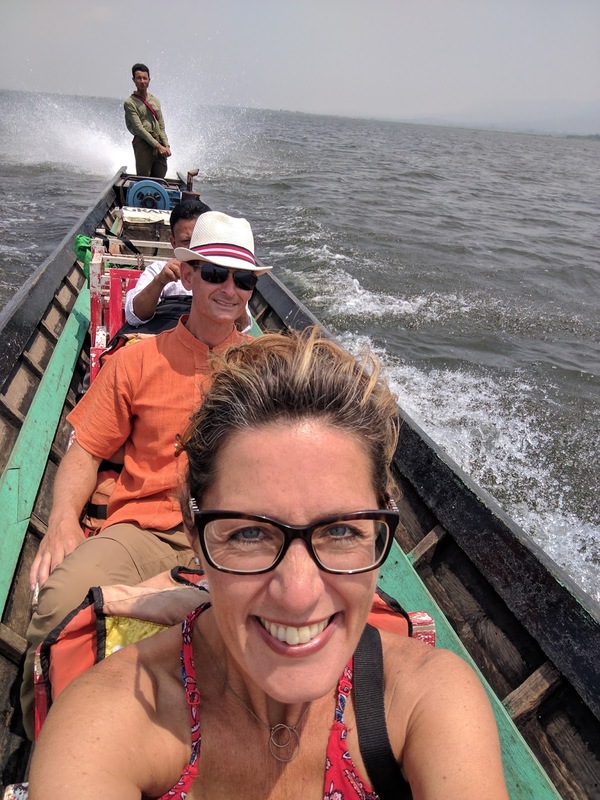 When we set off with the boatman, we cruised down the canal a bit to pick up our guide. 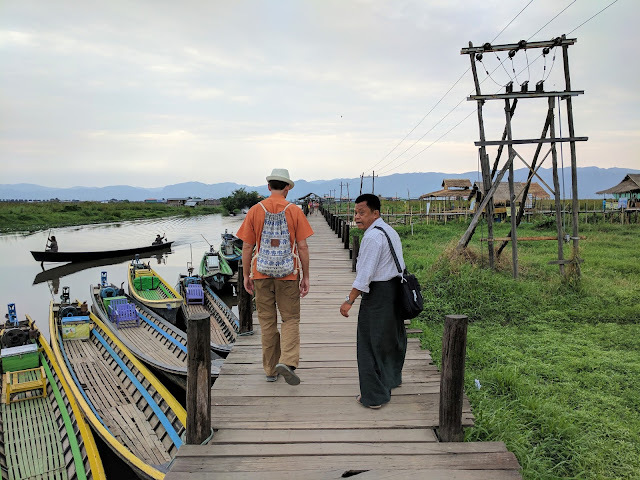 Approaching a dock, we thought, “Wow, Kyi’s son looks just like Kyi; it’s uncanny!” When he climbed on board, it became clear that it was Kyi, changed out of his black, Shan hotel uniform and into his longyi-and-shirt guide outfit. He apologized, saying his son was not feeling well, apparently with a headache after not sleeping the night before. We later learned that the son's wife had recently divorced him. 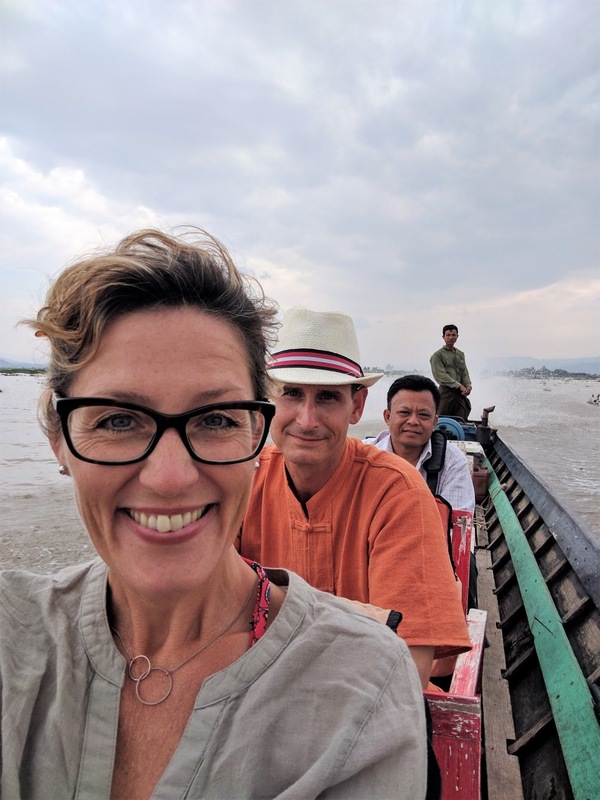 She took off to Yangon and never came back, leaving him with their now two-year-old boy. It sounds like Kyi’s son could use a therapist and some meds, but of course that’s not a thing here. Kyi said that he would tour us around the lake, since he had already promised us his son and it was a slow day back at the hotel. Kyi, giving me details about the lake, over the roar of the motor. Caroline, sitting in front of me, barely hears a word of his narrative over the boat noise. 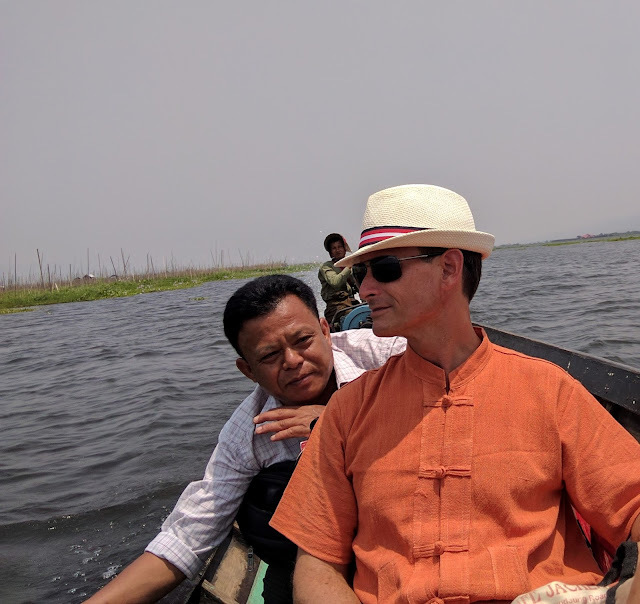 After 15 minutes or so cruising down the canal connecting our town of Nyaung Shwe to Inle Lake itself, we emerged onto open water. I expected it to be much more crowded with tourist boats, but we rarely saw any once out on the lake. 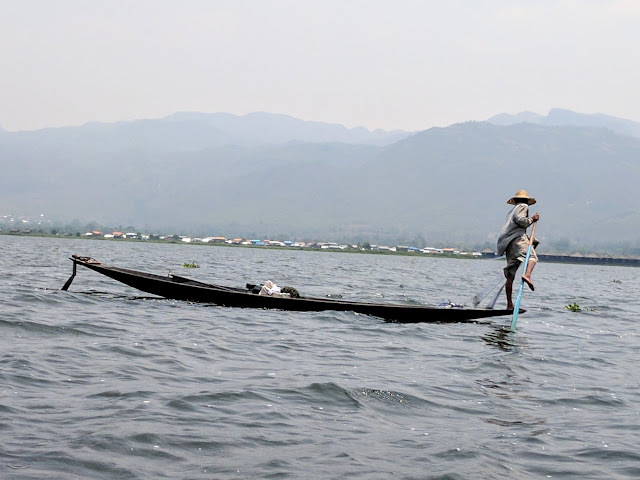 We passed the famous balancing fishermen, dressed in a variety of outfits from traditional Shan wear to more current track pants & t-shirt combos. I was somewhat surprised to see that they were just out….actually….fishing. It wasn’t a putting-on-a-display-for-the-tourists situation. We tried to get some good photos (of course), but never came close enough to get anything magazine-worthy. 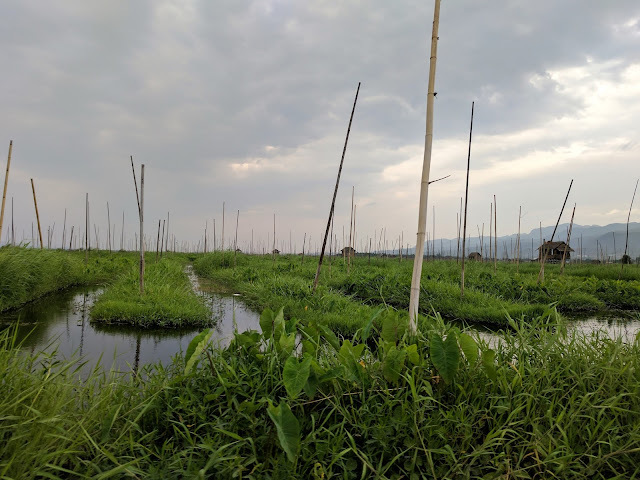 We passed the huge floating gardens, where they mostly grow tomatoes twice per year. The most common site, however, were the long boats heaping with seaweed and/or moss. Usually there was just one person with a long, pitchfork-type tool collecting mounds of the stuff. This is used as fertilizer, and also as feed for chickens and pigs. Traveling all the way from the north end of the lake to the southernmost point, we went down some canals through a few “floating villages”, ramshackle groups of houses set up high on stilts. The water in the lake is low right now, but will rise 5-7 feet during the rainy season. 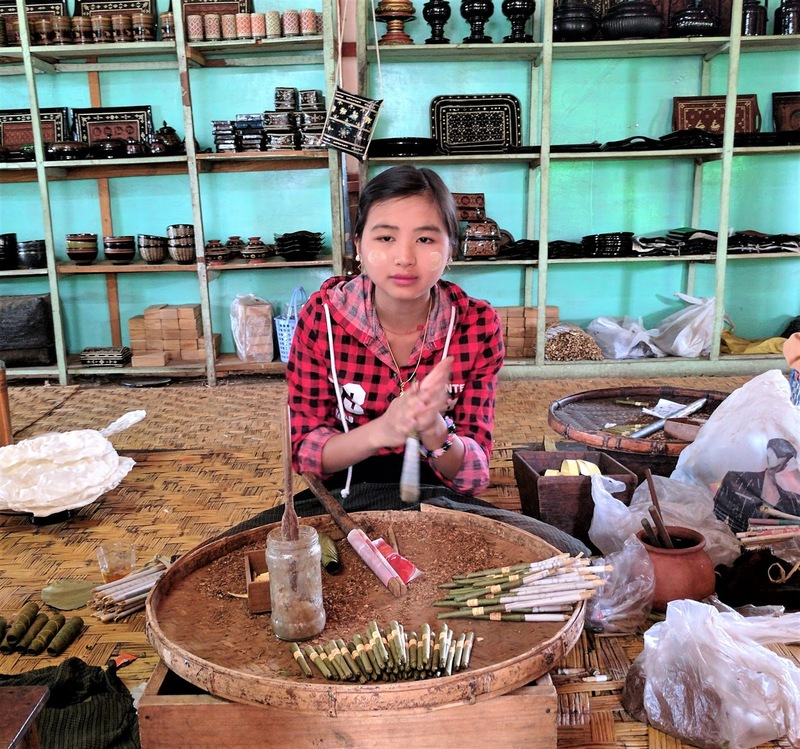 The afternoon was spent going from village to village, where Kyi would take us to various workshops (called “factories”) where they make local products, and guides get a commission for any purchases tourists make. Poor Kyi, he didn’t realize what a couple of non-shoppers he was taking on board. 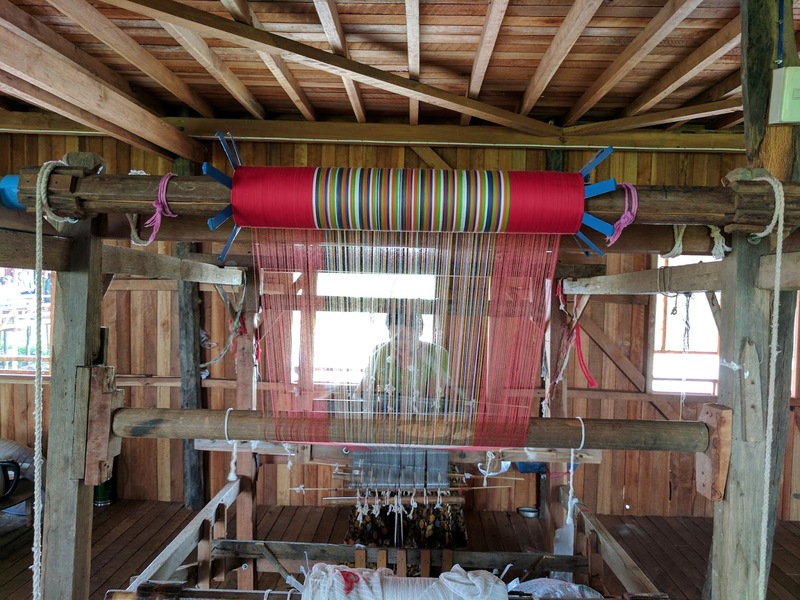 We went to a weaving workshop, where we saw what was actually a fascinating display of how they create lotus thread and weave it into fabric. 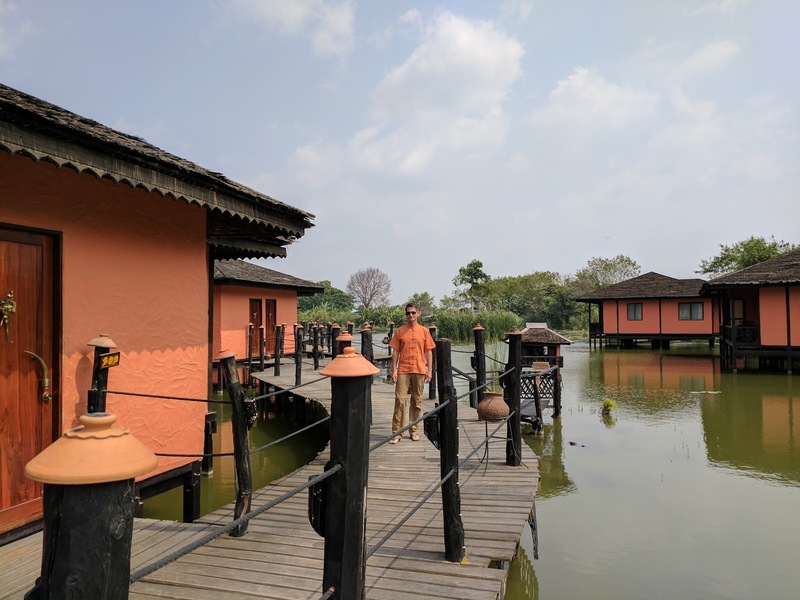 It was attached to a very nice showroom stocked with high-priced lotus and silk merchandise, amongst more standard cotton clothing, bags, and other souvenirs. 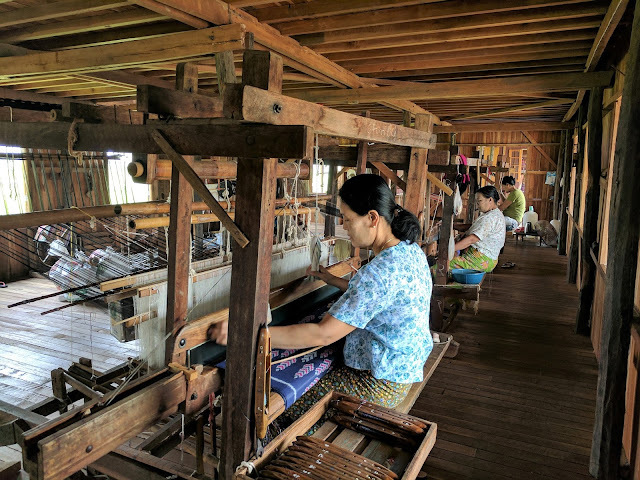 They had the same white, Shan shirt I had already bought, which sold for $25 versus the $6 I paid in Kalaw. Gotta pay for the showroom – and the guide commission! Caroline was close to buying a mostly silk and partial lotus scarf, but ended up passing, since we knew there was a substantial markup and we hadn’t had a chance to look around elsewhere. 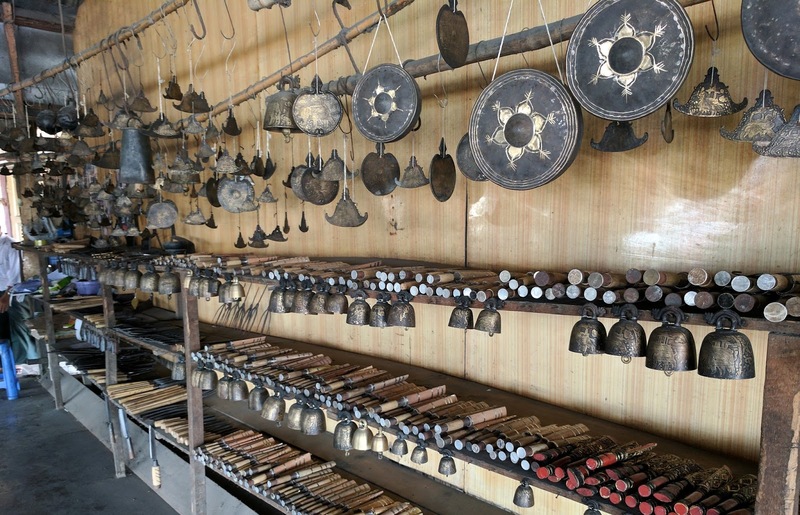 Other workshops included a blacksmith, where we actually bought something(!) – a decorative cowbell. This was after much consternation and debate about whether we wanted to carry around a heavy hunk of metal for the next 4-1/2 months. Apparently, we decided that we did. Decisions, decisions... buy a bell? How big do we dare? 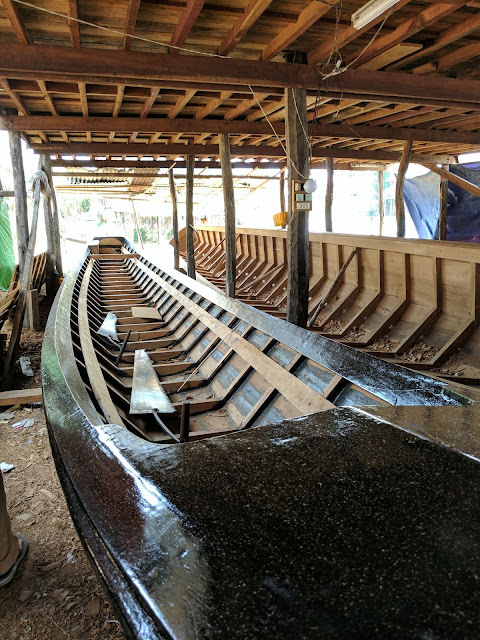 We also went to a place where they built the long, Inle-style boats out of teak, and coat them in black teak sap. Inside the boat factory, we sat, mesmerized, watching a group of three local ladies rolling cigar-style cigarettes (called cheroots) for quite some time, while Kyi discussed how upset it makes him to see his countrymen getting drunk on cheap alcohol and high on their local cocktail of cough syrup and opium. You can buy a liter of the cheap alcohol for about $0.50, but apparently its high ethanol content wreaks havoc on the livers and brains of addicted users. Boats under construction - don't touch the fresh lacquer! It's sticky, as Kyi found out the hard way. 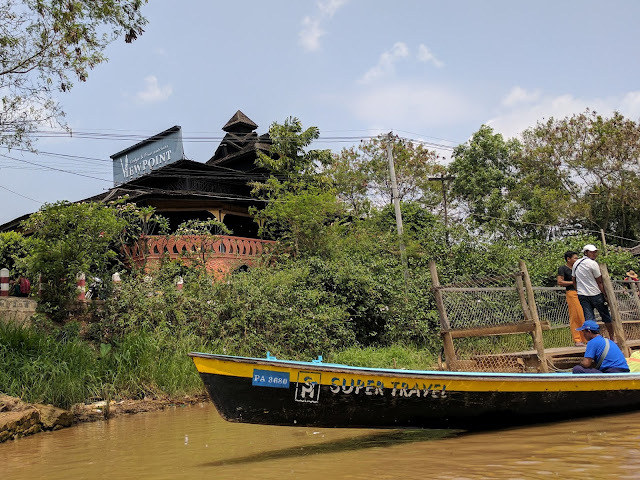 We stopped for an unmemorable lunch of cucumber salad and wok-fried cauliflower, where Kyi dined in the back with his boatman friend despite our invitation to join us. Then more town-hopping, where we went to see a group of “long-neck” women on display in a shop. 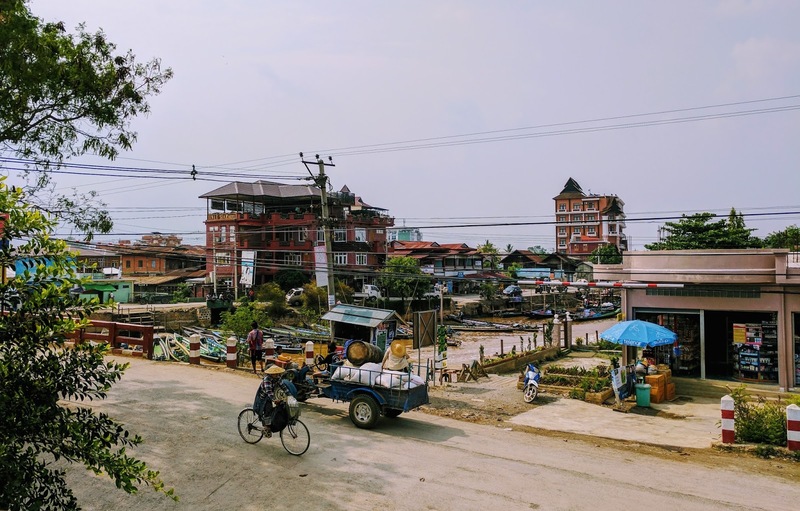 We’d successfully avoided going to any of the controversial long-neck villages in Thailand. 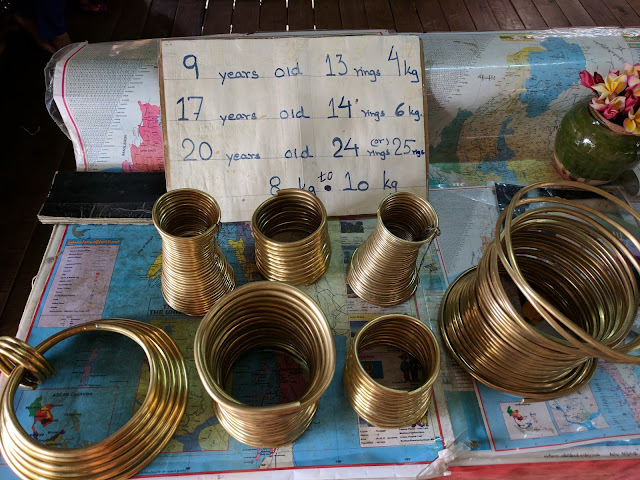 Starting at age 9 or so, brass rings are put around these young girls’ necks. More are added throughout their lifetimes, stretching out their necks (apparently it’s part illusion, part deformation). Seeing how the purpose these days seems to be to attract both local and foreign tourists to come and take pictures of these women, it gives the feeling of a human zoo – exactly as we’d read about. I think we displayed enough discomfort to Kyi that he felt the need to defend the practice, telling us that these women are proud of the tradition. Maybe so, but we headed out rather quickly. Next up was the jumping cat monastery, which sadly no longer has any jumping cats. As Kyi explained to us, the monk who formerly trained the cats, during downtime between scripture, had passed away four years ago. But we stopped to admire the 160-year-old teak structure anyway. Our final stop before heading back to the hotel was a village on the northeast part of the lake, where we got out of the boat to walk down the long pier into “town.” Everyone in town (and probably many other of the 170 villages surrounding the lake) were there to watch the exciting finals of a volleyball tournament. We watched for about ten minutes, as the talented players faced off in a close match. Heading back down the pier after watching the village volleyball match. When did Scott get so tall? By dinnertime, I wasn’t feeling so well, but we ordered the fish-and-potato tempura with a red tomato-chili sauce off the small plates portion of the menu back at the hotel. It was delicious, and I wished I had an appetite to eat more than one of these greasy but tasty fritters. Despite the lack of the excitement of good food and drink, it was a great day on the lake.